A full-pressure suit is a form-fitting, fully pressurized garment that surrounds the wearer with pressurized oxygen. It uses about 3 pounds of pressure per square inch on the body when inflated, creating a mobile, Earth-like atmosphere. The Mercury program was NASA’s first attempt at putting a man into space. In 1961, a small capsule called Freedom 7 carried Alan Shepard beyond Earth’s confines for a suborbital flight lasting just 15 minutes and 28 seconds. It took about 45 minutes for an Apollo astronaut to put on a spacesuit. During a mission, astronauts helped each other in and out of complicated suits, checking every connection and zipper to ensure the spacesuit was as tight as possible. Spacesuits were designed to fit the specific mission. Mercury astronauts who never left the spacecraft and remained seated throughout the flight had their spacesuits designed with this in mind. However the spacesuits for the Gemini program, a mission that required the astronauts to work outside the capsule, required a heat-resistant, flame-retardant suit. Why do extra vehicular spacesuits—the suits astronauts wear outside the spacecraft—need to be insulated? Temperatures can reach 250 degrees F in direct sunlight and -250 degrees F in the shadows of space. The Gemini VII mission of 1965 lasted 14 days and took place in a living space no larger than the front seat of Volkswagen Beetle. During launch and re-entry, astronauts on Apollo missions wore IV (intra-vehicular) suits that were relatively comfortable and could be removed and stowed away inside the craft. During the flight, astronauts either donned long-john-style “constant-wear garments” or in-flight coveralls, all made of “slippery” white Teflon. 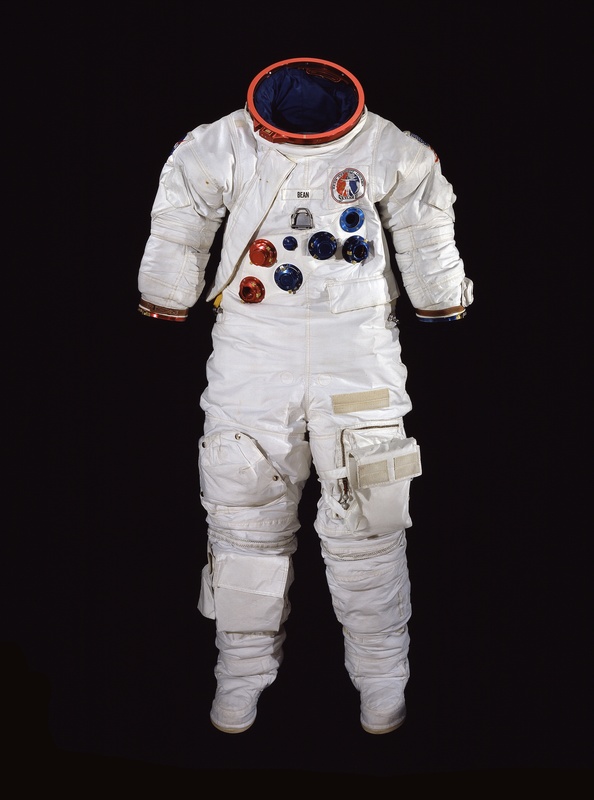 Astronaut Alan Bean wore this A7-LB suit on the 1973 Skylab 3 mission. Bean logged 1,671 hours and 45 minutes in space, including more than 10 hours of EVA (extra vehicular activity).